If you haven’t heard of Daniel Boulud, he’s a world class, Michelin starred, fine dining power house chef. If you don’t know what it means to be Michelin starred, it basically means that you’re at the top of your game and people aspire to create and present cuisine like yours. Dalmore states that this is the first time a single malt scotch whisky has ever worked in collaboration with a chef to create a limited edition whisky. After selecting whisky from ten different cask samples, working with Richard Paterson, was able to then create the final bottling consisting of whisky from Muscatel, Madeira and Port casks. Limited edition of 1000 bottles exclusively for the U.S. market. On with the review to see how this came together. Color: The liquid in the bottle looks a dark red oak and in the glass it’s an amber grade syrup. Nose: Upon opening the bottle of this rich looking whisky, I smell fresh berries like blueberries, strawberries and currants. An orange scent with a cigar note lingering behind the fresh berries is present. Very light caramel aromas with vanilla extract. Light cereal scents with heather. 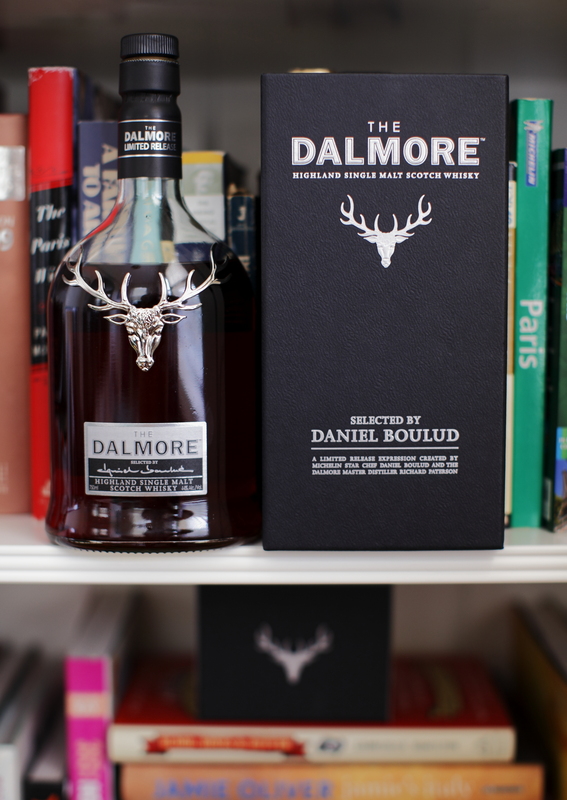 Classic Dalmore chocolate, raisins and toffee are definitely filling the glass. Palate: The flavor of this whisky is very remarkable. The amount of layers are incredible and easily understandable how this whisky can and should pair with food well. The initial flavor is dark plums, raisins soaked with an orange liquer. Very savory spices like nutmeg, almost a cumin flavor and definitely 90% or higher dark chocolate. The sweetness on the tongue leaves relatively quickly and goes right towards the savory side of things with almost a smoked meat or a roasted duck a l’orange. Finish: The finish is a lot more of the same with very complex flavors and layers of flavors. Caramelized sugars, and black cherries. A thick toffee pudding studded with figs, then doused in Ouzo and set on fire like Greek Saganaki. Breathing out always seems to unleash more flavors, causing me to reach for another sip. At 44% abv, this is an extremely easy drinker and there is no heat whatsoever. There are so many layers of flavors ranging from sweet to savory that it will keep you coming back for more and keep you thinking about what you’re drinking. A lot of people like to relax with a dram over good company or a cigar. I feel like this whisky is more like reading a ‘choose your own adventure’ as you’ll find yourself going back through the pages to re-write your history. If you can find yourself a bottle, it’s more than well worth it. Sounds like we need to go shopping! Nice read Scotch!